If you read my blog,regularly, then you know my love for ladoo/laddu. I can go ga-ga over them. Easy to make, versatile, portion-controlled, 'n' number of varieties can be made using different flours. I chose this delicious Gluten-free and vegan ladoo from Suma's palce. She has made it using Ragi hurri hittu, Hurri means Roast and hittu means flour, so it means roasted ragi flour. Imagine roasting whole ragi at home and making flour!!! Suma says, some might even powder it with kopra(dried coconut) and nuts too, to make it more healthy and delicious. This Ragi hurri hittu is then mixed with jaggery,coconut and ghee to make ragi balls, which is not only delicious, but healthy too. Considering the amount of adulteration in store-bought snack bars these days, home-made goodies like these with healthy ingredients are a great choice and a tasty way to introduce kids to our age-old food practices and our own health bars/balls. The Ladoos were super hit at home, I made extra and gave it to my SIL who is in her family way. These energy balls were a super hit among kids too, my Lil one, gobbled 2 ladoos while i was still shaping them. Coming to the recipe, i have used store-bought ragi flour. Wanted to try making hurri hittu at home, but since i m leaving in another week for my vacation, not making anything extra, that will lay around till i come back. 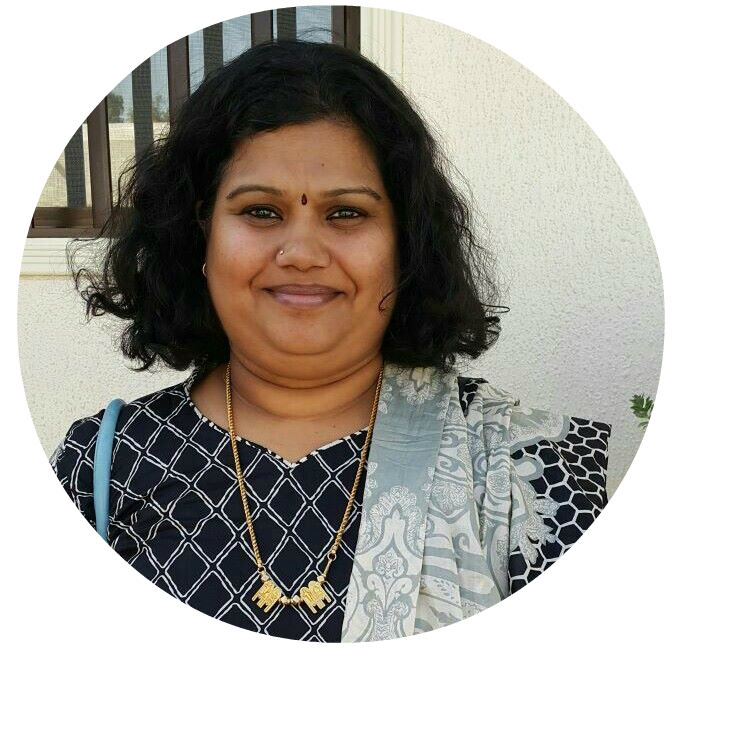 In case you want to try, here is the link for suma's place and another link to make things easier. Dry roast ragi flour, almonds, cashewnuts, sesame and dessicated coconut separately. I dry roasted in the microwave. In a Microwave safe plate, spread the flour and microwave high for 3 minutes, take it out every 1 minute and stir using a spatula. Repeat the same with the nuts, coconut and sesame seeds, but reduce the time to 2 minutes. Let the ingredients cool well. Take cardamom and cloves in a small mixer, add tbsp of jaggery and powder it. The jaggery is added to aid grinding of the cardamom well. In a food processor or your mixer, take the nuts (almonds, cashewnuts and sesame seeds) and grind it to a powder. Do not grind continuously, we just need to powder the nuts first. So, grind in short pulse to powder them. Once nuts are powdered, add ragi flour, coconut, jaggery powder and powdered cardamom-clove powder to this nuts powder and grind it together. Now you can grind continuously for a minute for the nuts and seeds to release oil/fat that will help in binding the laddoos. Once the mixture is mixed well and clumps together, remove it to a flat plate and start making ladoos, Take a handful of this powder and press it in between your palms and shape it nicely into a ball (ping-pong ball size). If you want to decorate it more, just dip the tip of the ladoo into oil/ghee and dip it again on a plate of crushed pistachios. Store it an air-tight container. This keeps well on the counter for 3-4 days. If storing for more days, then refrigerate it. 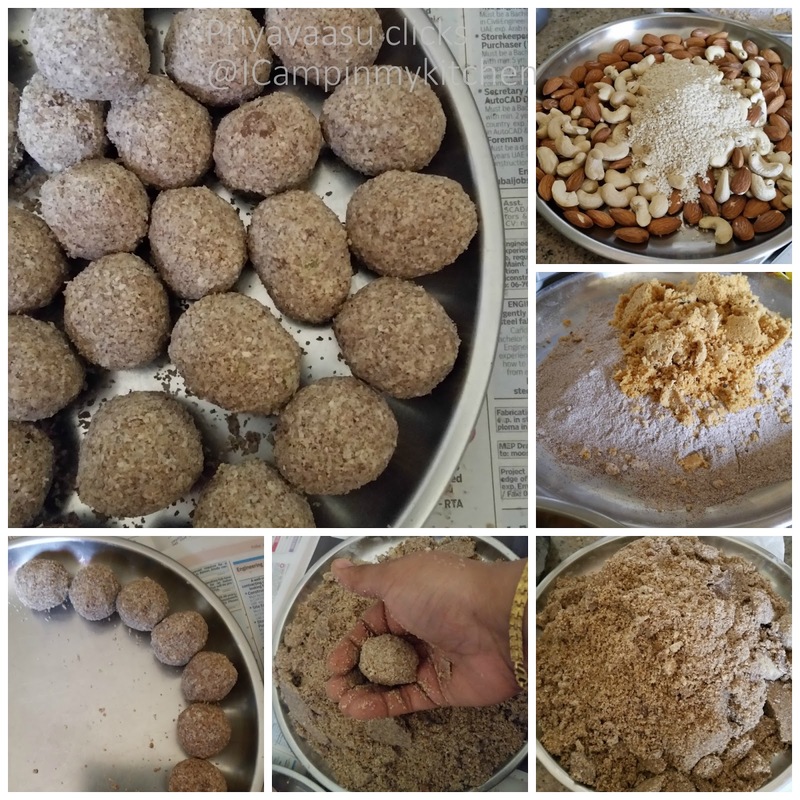 You can add a tbsp of ghee, if you prefer while roasting the ragi flour, it will give a nice aroma and taste to the final ladoo. While shaping the ladoos, if you feel, it is still dry, add some ghee and shape. Milk can also be added, but then it should stored in the refrigerator, as it might not stay good on the counter for long. 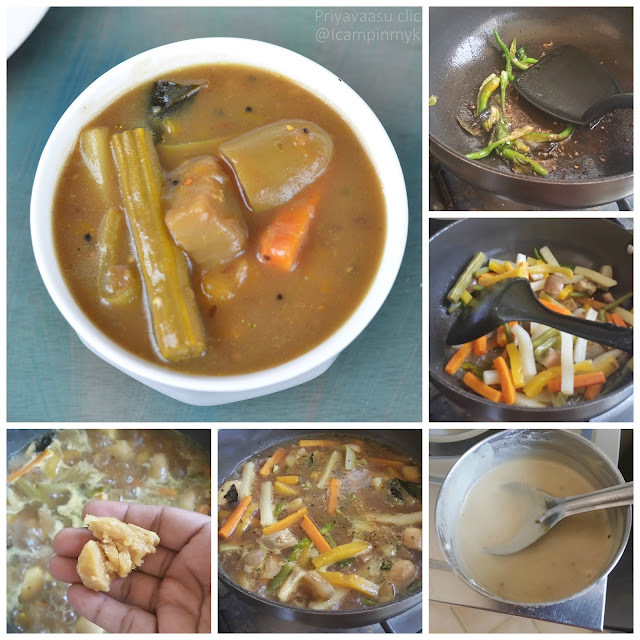 The next recipe from Suma's place is an authentic andhra-special stew, dappalam. The main reason for me to select this is the name, it so rhymes with appalam and it is fun to say this name, dappalam. I remember Kareena Kapoor's scene in 3-idiots, Why gujarati food is name as if it is a loud cracker, Dhokla, Fafda, i line this dappalam too along that naming convention!!! Jokes apart, this stew is a perfect match with hot steaming rice and a mild curry by the side. It is a quickie to make and also can be made whatever leftover veggies you have in your kitchen. Just steam cook , do tadka with the spices, simmer for 10 minutes, you ahve your lunch ready. I even made some tangy poha using the leftover gravy the next day, matched the taste so well. Steam the cook the vegetables separately. If cooking with water/boiling the veggies in water, then drain the excess liquid anduse them in soup or for soaking the tamarind for the extract. Do not waste the liquid. Extract juice from the water-soaked tamarind. In a pan, heat oil for the tempering, splutte rmustard seeds, crackle cumin, add hing and curry leaves. Once the tadka is done, add slit green chilies and saute for 30 seconds. Next add pre-cooked vegetables and the tamarind extract. Mix rice flour with 2-3 tbsp of tamarind extract/water, mix well without any lumps. Add this this to the stew. Add salt and jaggery. Now let the stew simmer and reach a thick consistency. It should taste sweet, spicy and tangy at the same time. So, check taste and adjust the sweetness by adding the required jaggery. Once it reaches a thick soupy consistency, take it off the heat, garnish with chopped coriander and serve it along with rice. The Last week of BM, i took paired blogger series as my theme and i m paired with Suma of Veggie Platter. Suma, a blogger buddy,who has been in BM group for so long, probably from the day it started and best known for her clean and crisp food clicks and her lip-smacking dishes. Her amazing bakes this marathon, stunned us all. She gave a totally different theme, naming each day of the week with a fun adjective and baked something different for every day. Not many of us, can think of a theme like that. First i planned to bake from her baking collection, but then decided to look into her traditional dishes and selected 3 from them and made it for this marathon. Selecting 3 from her blog, was a bit tough, i shortlisted 10 and then skimmed it to 3 from there. The first recipe is an easy breakfast recipe, cucumber roti/Southekayi rotti. I first made it for dinner and paired it with Aviyal and also as breakfast for another day. The breakfast i paired it with tomato chutney and felt it, as a better combo than aviyal. This roti needs a spicy and a saucy side, so you can also pair it with pickle or any spicy yogurt dip. My Elder one liked this rotti, though it was a bit spicy for him ,he panted a little, drank water, but came back again for second helping, maybe his taste buds are changing now. But it was way too spicy for the younger one, he just took one bite and left it saying "kaaram amma". So, if serving for kids, try to decrease the chilies and add peppercorns and increase the amount of coconut to one or two tbsp. In a small mixer, take coconut, green chilies, coriander together, add one or two tbsp water and grid to a fine paste. Wash and peel the cucumber. In a large bowl, take rice flour, add salt and shred the cucumber directly into the rice flour bowl. Once kneaded, divide the dough into a little larger than ping-pong ball, but less than that of a tennis ball size. Place a cast iron tava on the stove, let it get heated in a simmer flame, you got to maintain the same heat to get a evenly cooked and nicely browned rotti. Use a plastic cover to pat/shape the rotti or you can pat the rotti directly on to the hot tava. I use my sandwich bag for the same. 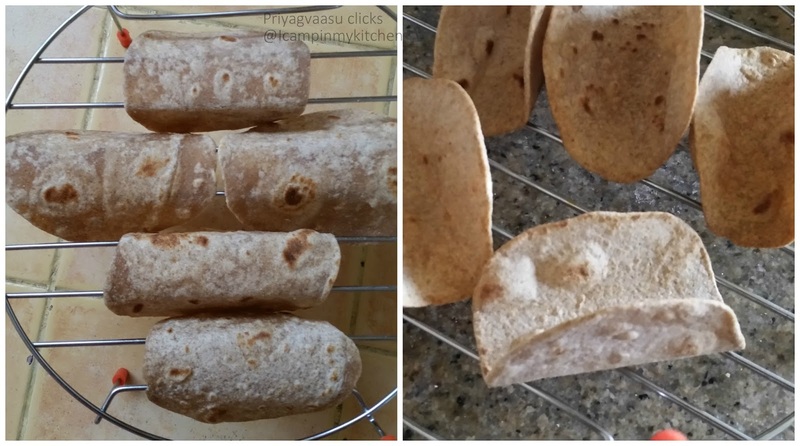 Take a dough ball and pat it to 4-5 inches round flat rotti, make a small hole in the center. Take the plastic cover in your hand and remove the rotti on your other and transfer it to the hot tava, drizzle 1/2 tsp of oil around the edges, cover and cook one side for a minute, the edges will turn brown, flip and cook the other side, drizzle oil again. Transfer it to another plate. Serve it along with a saucy chutney. I served it with Tomato chutney. Since it take a longer time to cook, it is better to keep the next rotti patted ready while the one is cooking. Rotti's taste better when served hot straight from the tava. If storing it, to be served later, better warm it in the microwave for 20 seconds and serve it hot. Sending this to Kids Delight - Fruits in any form, happening @ Harini's Space, an event by +Srivalli Jetti. The last in the series of Ice-creams, is this flavorful, citrus-y Orange ice-cream. 2 days before, while idling in FB, i saw this post in a group, I totally fell in love with the way it was served, when checked the you tube link, it is similar to the pomegranate ice-cream. I was bit hesitant to try orange and cream, was scared whether the cream will curdle or people might not love that taste. But to my surprise, it is a super hit. The small change i made to the original recipe, is the saffron and liquid glucose. Do try adding saffron, it gives you a mild taste in between the orange creaminess. Everybody at home loved it and they had this for breakfast, can you believe?? yes, after i finished clicking the photos, both my hubby and my kiddo sat together and finished the glasses, clean!!! Juice the oranges first. I first tried to cut the top of the orange like a shell and scoop out the flesh of it using spoon. But the skin was very delicate, it started tearing apart. So, i simply cut them into two halves and extracted the juice using the old orange squeeze juicer. Try to use the juice along with that pulp, it gives a nice citrus burst in your mouth. Add sugar and lemon juice to the extracted orange juice,stir well and set aside until use. I used normal sugar, so i stirred well with a spoon for it to dissolve well. you can also use powdered sugar, to skip that stirring. In another large bowl, take the whipping cream, whisk using an electric blender until soft peaks form. Add saffron and whip again for a minute. Now add the orange juice, liquid glucose and food color to it and whip again, for it to blend well. Pour the blended cream into a freezer-safe plastic box with lid. Freeze atleast 6-8 hours or overnight. While serving, take out the ice-cream and leave it on the counter for 10 minutes. Use an ice-cream scoop spoon for easy handling, scoop and top it with your favorite toppings and serve. Sending this to Kids Delight - Fruits in any form, happening @ Tamalapaku, an event by +Srivalli Jetti space. For the second day i bring you another yummilicious ice-cream using fresh pomegranate juice and cream. The recipe is from Nigella Lawson's website, it is a foolproof recipe and we loved the taste of pomo's in the ice-cream, so fresh and light on taste. Original recipe doesn't use liquid glucose, i have used it seeing PJ's ice-cream post, where she mentioned, it gives smooth texture to the ice-cream. You can also try adding a tbsp or two of rose syrup, but i didn't as i want the original flavor to dominate and not that of the essence. I m not going back to store-bough ice-cream any soon. Try it and you will also feel the same. Cut open the pomegranates, remove the seeds. I normally cut it open into a bowl of water and remove the seeds inside the water. Seeds come out clean, no mess around. The white pith will float on water, remove it and strain the water to get the seeds. Take the seeds along with sugar in a blender and blend to release the juice. Do not blend continuously, blend in shot pulses. Strain the juice in a strainer, to separate the seeds. Discard the seeds. add lemon juice to the pomegranate juice and mix well. I got about 1 & 3/4 cups of fresh juice. Keep aside, until use. In another large bowl, take the cream and whip it until soft peaks form. Now add the pomegranate juice to the cream , along with liquid glucose and whip until everything is mixed well. pour in a freezer-safe box with lid and freeze for a minimum of 6-8 hours or overnight. Once set, scoop, garnish with some pomo pearls and nuts of your choice and enjoy. 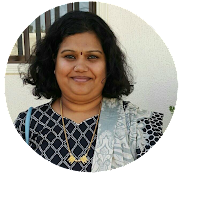 Sending this to Kids delight - Fruits in any form, happening @Tamalapaku, event by +Srivalli Jetti. Weekend again, i m back with another Amla/Gooseberry/Amla recipe. Yeah, i said i have more in my pocket to share with you all. Today's recipe is really very simple, all you need to do is grind and mix it with curd and do a simple tadka. As i have said in my earlier posts, i always have a bottle of uppu nelli/amla in brine, in my fridge always. I cannot resist fresh, green amla looking at me while shopping for veggies. So, i make a batch every 10 days. This raita is made using that uppu nellikaai, just blend with some coconut, you have a delicious side to go with idly/dosa/upma any South-Indian breakfast. For lunch i paired it with rice and bhindi curry. It went well when mixed with plain rice and paired with curry. For dinner, i served it with Varagu upma and the combination was out of the world. Remove the seeds from the amla and chop it roughly. Take the chopped amla, coconut, ginger together in a small mixer. Grind it to a fine paste using 2 tbsp of water. Whisk yogurt in serving bowl, add this ground amla mixture to it. Taste and add salt, mix well. In a small tadka pan, heat oil, splutter mustard seeds, crackle cumin, add the slit chillies. Pour tis sizzling tadka over the raita. Garnish with coriander leaves and serve along with rice. It tastes delicious when mixed with steaming hot rice and served along with a spicy curry. 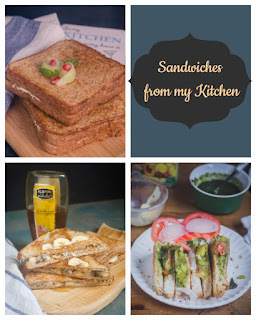 Sending this to Cooking from Cookbook Challenge, a weekly event happening @ +srivalli jetti's space. For the final day of tortilla dishes, i went experimenting a little. First i thought of making a simple quesadilla or a wrap. But them saw these delicious taco recipes here. There were 81 interesting taco recipes, loved each one of them. So, i decided to pick one of them and try for our evening snack. Since i had some broccoli and canned chickpeas, i went ahead and made them as filling and topped it with some lemon cream. The real excitement was in making of taco shells. It was pretty easy to make at home and felt good to hear that crunch while biting into the tacos. While we both enjoyed the tacos with the stuffing, the kiddos enjoyed the shells as such, crispy and crunchy munching on it!! Prepare the stuffing first, Take broccoli florets and chickpeas in a large bowl. In another small bowl, take oil and spice mix, mix well. 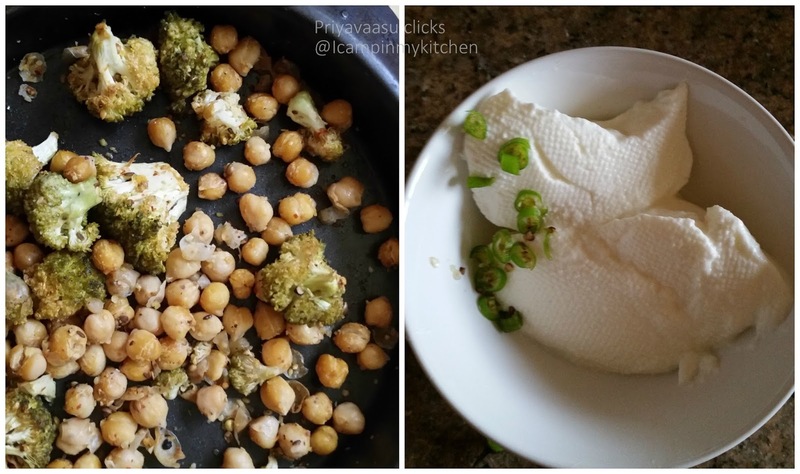 Pour the spice oil over the broccoli and chickpeas and toss well for the spices to coat well. Let this sit for 30 minutes. Preheat the oven to 180C. Grease a cake tin, spread broccoli and chickpeas in the tray and bake them for 20 minutes, taking it out and tossing it once after 10 minutes. Let it cool, keep aside until use. I had some leftover tortilla dough. Made 5 small portions of it and rolled out 5 tortillas of 3 inches in diameter. Cook them on a hot griddle until brown spots appear on both sides. Keep them covered in a tea towel, until you cook them all. Preheat the oven to 180C. Once done, take your grill shelf that comes with your oven, place the tortilla inverted over two bars of the grill. Bake them for around 8-10 minutes or until crisp. Take it out and let them cool well. I used hung curd for the cream. Add lemon juice, chopped green chilies and salt. Give it a good stir, keep aside until use. Place the taco shells on the serving plate. Spoon the broccoli & chickpeas stuffing into it. Place 2 or 3 jalapenos and top it with cream and serve immediately. If not serving immediately, store the baked tacos in an air-tight container. I served two tacos with filling and rest 3 were nibbled by my two mouslings.